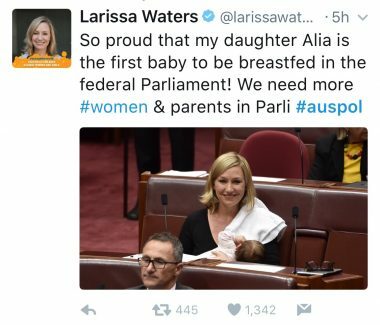 Bravo Greens Senator Larissa Waters who breastfed her beautiful baby in the Australian Senate today. 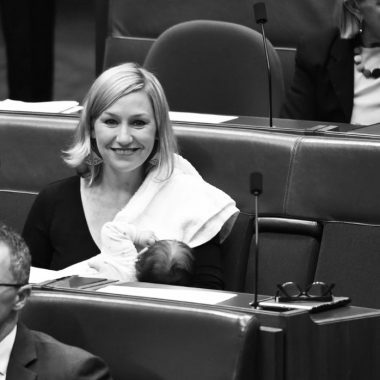 In her first appearance in the chamber since the birth of her second child, Waters brought her baby into the chamber during a vote on a Greens policy motion. And it will pave the way for more women in leadership. Because it normalises one of the most natural acts. We would be just as happy to see the baby being fed by bottle because it shows other women there is no “right” way to do anything as mothers. Former Victorian MP Kirstie Marshall was ejected from State Parliament when she attempted to feed her 11-day-old baby. Parliamentary rules were changed in 2016 to allow mothers to feed their children in the chamber. Breastfeeding mothers were previously given a proxy vote. in 2015, Kelly O’Dwyer was asked if she had considered expressing more to avoid missing her duties in parliament. Greens senator Sarah Hanson-Young was also forced to remove her then toddler during a division. 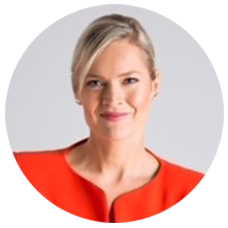 Tagged in Australian women in history, Breastfeeding in Parliament, Greens Senator Larissa Waters, Kirstie Marshall breastfeeding, Larissa Waters.